To be honest, I’ve read more fiction than nonfiction this year. I’ve needed the way that novelists reveal the architecture of human experience slowly, with more empathy and less sensationalism than America’s news cycle. There’s no podcast, cable news show, or periodical that could reveal the weight of racism or the flooded landscape of the Gulf better than Jesmyn Ward’s mind-blowing Sing, Unburied, Sing, or match the visceral depictions of refugees and escape in Mohsin Hamid’s Exit West. Even Jeff VanderMeer’s sci-fi dystopia, Borne, probes the relationship between biotechnology and the natural world with an intensity and intelligence that makes you think twice about Elon Musk. 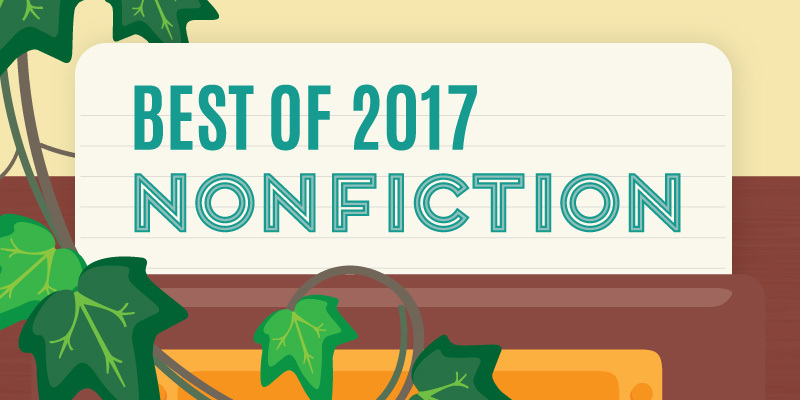 Still, Ward, Hamid, and VanderMeer have their peers in the nonfiction world. We’re lucky to have writers of tremendous passion and insight, who have the temerity to ask difficult questions, and who craft astonishing, relevant stories out of world history and current events. Perhaps like many of you, I’ve gravitated this year toward books that make me feel energized and, conversely, those that slow me down, because sometimes I want to get pumped up and enraged enough to fight the Man and other times I just want to understand him/her/they. Here are some of my favorites. What were yours? Dani Shapiro’s incandescent memoir, Hourglass, is a quiet triumph. A slim, thoughtful book, Hourglass manages to capture both the singularity of her marriage and the deep currents of love and fear that course through most intimate relationships. Shapiro’s husband is a former war correspondent who gave up travelling the world for their family, and her guilt over M.’s career is central to the memoir’s investigation of marriage. Is it fair, what we ask of our partners? Spare and vulnerable, Shapiro's narrative frequently rests to consider other writers' words on love, time, and partnership. Hourglass is candid, beautifully written, and provides fascinating insight into the lives of working writers. Feeling feistier than that? Timothy Snyder’s On Tyranny is also slim — it can be read in an hour — but it provides a great deal of historical insight and advice for how to engage in a post-truth (or as Snyder calls it, "pre-fascist") culture. Snyder is a celebrated historian of the mid-20th century, and he uses his encyclopedic knowledge of European fascist and communist regimes to reveal their 21st-century American echoes, and to arm the reader with directives that sound simple but can be remarkably courageous, like "do not obey in advance" and "make eye contact." On Tyranny is a comforting and a terrifying book: its comfort comes from knowing that resisting tyranny is possible, and its terror lies in understanding that such resistance is now necessary. David Grann’s absorbing Killers of the Flower Moon is much longer and less overtly political than On Tyranny, but it serves as a potent reminder that the US government has a long history of prizing greed over its citizens’ welfare — and that the FBI sometimes, sort of, does the right thing. Killers of the Flower Moon is the thrilling but deeply disturbing history of the Osage Indian murders of the 1920s. Forced onto a reservation in an inhospitable corner of Oklahoma, the Osage Indian tribe became the unwitting benefactors of the vast, untapped oil riches beneath their new homes. Catapulted from being one of the nation's poorest communities to the world's per capita richest, the Osage became targets for racist politicians and criminals, who envied and despised the tribe's new wealth. Only after the suspicious deaths of dozens of Osage Indians did the federal government step in to investigate, under the auspices of the cowboy lawman Tom White and the newly minted FBI. Equal parts murder mystery and scathing exposé of the US treatment of Native Americans, David Grann has crafted a true crime history that entertains even as it forces the reader to confront the evils of our national past and the uncomfortable parallels visible today. Franklin Foer (yes, he's related to Jonathan) is angry about big tech. Part of his rancor is personal: Foer quit his longtime position as editor and writer for The New Republic after clashing with the the magazine's new owner, Facebook tycoon Chris Hughes. But Foer asks that the reader both forgive and ignore his anger at Hughes, and take a moment to consider how Silicon Valley's products and ideas have slipped into our lives at the most intimate levels. Presented with a mirage of limitless choice, Foer contends that today's consumers are actually being corralled into making specific buying decisions — from toasters to political candidates — by enormous corporations like Amazon, Google, and Facebook. Such companies control much of what appears online, which is how the majority of us now shop for goods and get our news. As The Guardian points out, this "is not a book of small, gentle criticisms," but I'd argue that we're not living in small, gentle times, and that there's nothing small or gentle about having democracy elided by companies seeking profits and political power via the shaping of reality. Foer's a little intellectually pretentious, but his skepticism is valuable and especially worth thinking about around the holidays when those Echo Dots go on sale and people purchase smartphones for their loved ones. Siri's a stranger; do you really want to let her in? True and embarrassing story: I had to look up “woke” in the Urban Dictionary while reading this book. I like to think this is because I avoid social media in my private life, and not because I’m getting old. Janet Mock isn’t an amazing writer, but she’s a fascinating, accomplished, and yes, woke woman. Surpassing Certainty describes Mock’s evolution from a trans teen who hides her full identity in order to survive into a successful professional with the confidence to publicly embrace her story. Mock's gift for pairing incisive social critique with an emotionally rich accounting of her life makes reading her book a wonderful and eye-opening experience, like having a long talk with your best friend who just happens to be a feminist trans woman of color with an unconventional resume and a great deal to teach about how we do — and should — define womanhood. This powerful and sometimes shocking long-form essay uses the US immigration questionnaire for unaccompanied minors as a template to explore the movement of children from Central America and Mexico into the US. Luiselli, a Mexican-born novelist, worked as a translator for children seeking legal assistance, and found that the bureaucratic questions she had to ask didn’t adequately convey the trauma or dysfunction of the children’s experiences; in one notable section, a young man complains about being pursued by a gang at his new school on Long Island, the same gang that forced him to flee his home country — and which has its origin in the US. Empathetic and heart-wrenching, Tell Me How It Ends reminds me slightly of Younge’s Another Day in its insistence on the youth of its subjects: eight-year-olds travelling thousands of miles alone to reach a place of relative safety aren’t criminals, they’re refugees. Luiselli eloquently pleads for Americans to make that distinction.